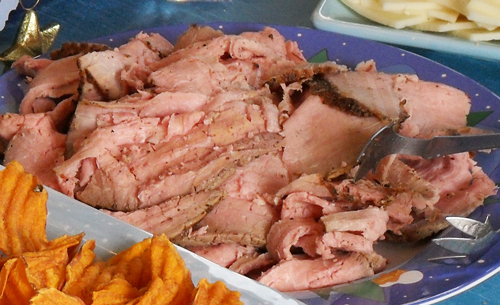 Ever wish you could make your own deli roast beef at home? 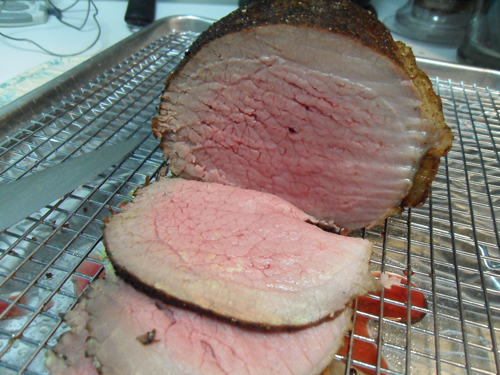 Luscious, tender (and lean) roast beef without the $12 a pound price tag? But I digress. 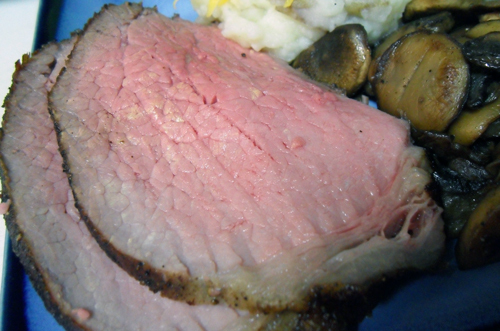 Delicious roast beef, from the January/February 2008 issue of Cook’s Illustrated. Did I mention this recipe is only 4 ingredients? Salt, pepper, beef, and canola oil. That’s it. And it uses a relatively inexpensive cut of meat, eye round roast. I can get a two pack of roasts from Costco for less than $4 a pound. We have one roast that week and I freeze the other for later. You want about a 3.5 pound roast, but larger or small is fine, just adjust the cooking times. The most important thing to remember about this recipe is you must plan ahead. 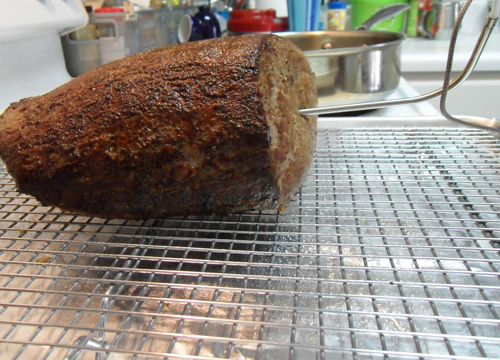 The roast is salted overnight, and then spends a couple of hours in a low oven the next day. So plan your time accordingly, and don’t serve a side dish that requires significant oven time, as it would have to wait until the roast is completely done to start cooking. Oh, and to make your life easier when cooking roasts or Thanksgiving turkey, invest in a probe thermometer. 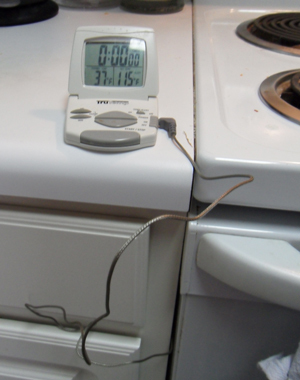 The timer/temperature part sits outside the oven while the thermometer sits in the roast inside the oven. I can’t imagine doing this recipe without it. Okay, so the night before you want to have roast beef for dinner, take your 3 or 3.5lb roast out of the fridge, and put it in a bowl or other container. If your roast has a fat cap and you’d prefer to remove that, go ahead. The fat can keep it a little more moist during cooking, but I’ve made it both ways and it’s delicious either way. 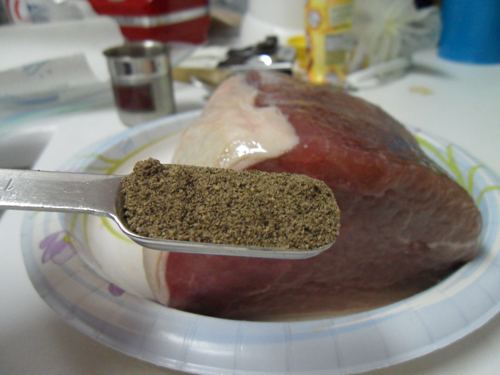 Sprinkle the roast with a tablespoon of kosher salt. If your roast is larger than 3.5 pounds, use a little more salt, if it’s smaller use a little less. If you’re using table salt, cut the amount in half – half a tablespoon equals 1.5 teaspoons. 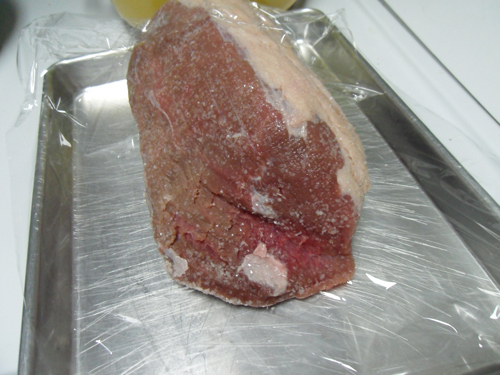 Rub the salt in to evenly cover the roast, wrap in plastic wrap, and refrigerate overnight. 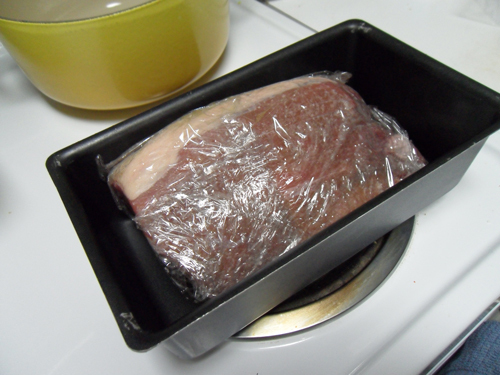 I like to put the roast in a metal loaf pan so the juices don’t get all over the fridge. The next day, take the roast out of the fridge, and let sit on the counter for about 30 minutes. This ensures more even cooking because you’re not putting a cold roast in a hot pan. Pat the roast dry with paper towels (don’t rinse the salt off), rub with 2 teaspoons of canola oil and 2 teaspoons of black pepper, preferably freshly or recently ground. I use a spice grinder and grind my own pepper every month or two. Turn the oven on to 225 degrees. Take a baking sheet and line it with foil (for easy cleanup, totally optional) and set a rack inside the pan. Heat a tablespoon of oil in a heavy bottomed skillet or saute pan over medium high heat until it shimmers – the oil moves fluidly and quickly when you tilt the pan. Carefully place the roast in the pan – it should sizzle – and brown on all sides. I set a timer and rotate the roast every three minutes. I brown the ends, too, but not for the full 3 minutes. Oh, I recommend you turn on your vent while doing this, as it can get a little smoky. When the roast is evenly and beautifully browned, transfer to the prepared baking sheet. Insert the probe thermometer into the roast, place in the oven, set your temperature alert to 115 degrees for medium rare (120 for medium). I walk away and forget about it until the alert sounds. 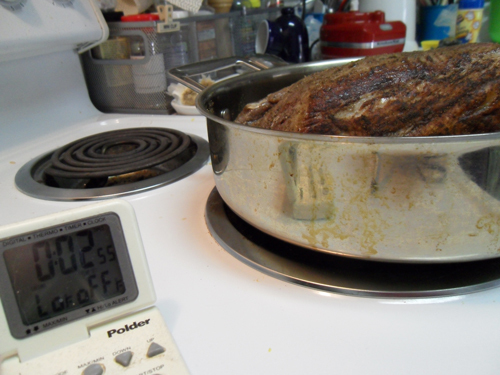 If you don’t have a probe thermometer, the roast will take about 1 1/2 to 2 1/2 hours, depending on the size. You’ll need to pull it out and check the temperature with a meat thermometer. When the roast reaches final temperature, pull it out and let rest on the counter, loosely covered with foil, for about 15 minutes. You should do this with any cut of meat, by the way. A lot is going on in cooked meat with pressure and heat and temperature, but suffice to say a rested meat is a juicier meat. The larger the cut, the longer it should rest. The final roast, resting for 15 minutes. Patience! 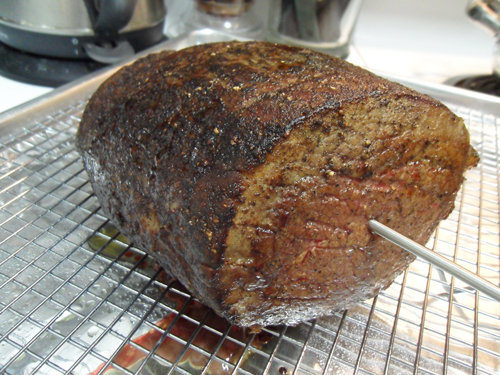 Once the roast is rested, slice thinly and enjoy as is, on a roll, in a wrap, or on a sub. Roast beef, sliced and ready to enjoy. Doesn't that look scrumptious? I’ve also served this at my Open House, and it gets rave reviews. Do you make your own roast beef? How do you like to prepare it? Let me know in the comments! Turned out real close to your photos. To make your meat photos look as good as mine, show some crusty bread, and a bowl of horseradish with sour cream. Wow wow wow our roast was simply amazing. I just prepped another one for dinner tomorrow night. I’ve always skipped over these roast as they were always tuff as nails no matter how I cooked them. I do not like shredded pot roast as I grew up on them & never really loved anyhow. I always preferred a real roast beef like the deli has & now we have that thanks to your amazingly simple & inexpensive recipe. Our roast was larger & was a hair too rare last time, so I’ll adjust the temp 5 degrees or so to help avoid that this time. Thank you so very much for sharing this! It’s a staple in our dinner rotation now & love having leftovers to snack on, make a sandwhich, or even have roast beef & gravy over bread, or noodles with the leftovers. I highly recommend buying a larger roast as you’ll enjoy the leftovers for sure. Thanks again! !